Ford ZETEC Reverse water pump impeller and pulley kit for water directional change. Idler pulley bracket for water pump directional change. Kit includes machined aluminium bracket and all fixings and a Gates 6PK 955 belt. 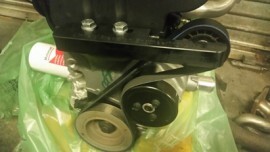 The kit requires a 70mm x 18mm 6 rib pulley from a doner Ford Zetec engine. Or additional aluminium pulley (listed separately). Quality item from official supplier. Full VAT invoice issued on delivery. If you are having problems ordering online, please call our office on 01934 631500 to make payment.